Home › The Collector › What’s Your Vision for “Mobility on Demand” In Humboldt? What’s Your Vision for “Mobility on Demand” In Humboldt? The Humboldt County Association of Governments (HCAOG) has scheduled a special meeting for Thursday morning to begin the process of envisioning “mobility on demand” in Humboldt County. Do you want to see more bike-sharing, or maybe a pedicab app? How about a “public Uber” option? Expanded dial-a-ride services? The possibilities are endless. Come out and have your say. The California Transportation Commission’s agenda next week includes funding allocations for safety projects on Highway 199 (high-friction surface treatments, signs, rumble strips and guard rails near Gasquet) and Highway 299 (shoulder widening near Willow Creek). 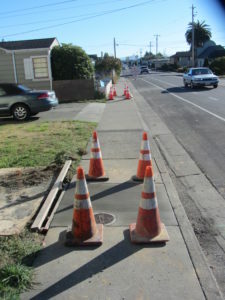 Will New Eureka Fast Food Development Decrease Safety for Pedestrians? In light of the Eureka City Council’s recent approval of $450,000 for a traffic light to serve a new fast food development on Broadway, we thought this study showing that these types of land uses are associated with more pedestrian collisions was particularly timely. One of the lawsuits against the highway-widening project through the beloved State Park got another hearing this week. Basically, the Governor’s office and Caltrans said rail is a great idea – if it works for your area. Hmmm. Sidewalk construction should provide safe detours for pedestrians. This one doesn’t. Send your pictures of bike lane or sidewalk obstructions to colin@transportationpriorities.org. The first official progress report on so-called Sustainable Communities Strategies, which are plans to reduce driving that large metro areas in California have been required to adopt for a number of years, shows that there’s a marked lack of follow-through. Californians are driving more, and that threatens all of our other efforts to reduce greenhouse gas emissions. Because minimum parking requirements are bad urban policy! ← Who Likes Traffic Lights?